I am writing to submit academic assessment of the student Ajith kumar P who’s being supported by India Sudar. Institution BE – Mechatronics-2nd Year,SNS College of Technology, Coimbatore. Family Background Student’s father is a tea master and The family total income is pretty much low. He scored well in +2, govt school. He is having an elder sister studying BE 3rd year in Coimbatore. 1. Last year SSLC result, 54 students passed with 16 distinction, 1 student scoring 603 marks and only 4 students did not make it in the SSLC exam. This year head master is working hard to make it 100% result. 2. HM updated students are missing the note book drive. 3. All the teachers are very motivating and taking interest and initiatives to resolve the problems of school. 4. Sufficient students to teacher ratio. 5. Infosys foundation has donated few computers. 6. Few parents are not able to give the 200 Rs school fees and when asked they will make kids stop going to school. In such cases school teachers are helping. 7. We interacted with 8th, 9th and 10th students and made students to talk about school, home and surrounding problems which they are facing. 8. To this school we had provided sports kits and library 2 years back and still the materials are being used very effectively. 1. Interactive CD’s and DVD’s for Maths, Science and Languages are required. Only social and kannda they are having and running the show with only 2 subjects only. As per teachers interactive material make them to teach better. 2. Career Guidance program for 9th and 10th students. 3. Notebooks for 8th, 9th and 10th students. Students come from very poor family background and cannot even afford to buy 1 note book also… hence head master was saying that students were missing notebook drive a lot. 4. Building for labs: Its being 3 – 4 years that request is being raised with govt to construct 2 rooms for labs and class room, but no response so far, hence requesting if any thing can be done from India Sudar. However, one of the NGO has come forward to construct but still HM is following up. Augustia foundation has donated lab material worth 3 Lakhs but there is no place to keep the lab material and all are getting destroyed with out using. 5. Soft Skill Training: HM requested that they are well versed with academics, but students are lacking in the soft skills and students don’t open up at all, hence requesting to provide some soft skills materials as well as sessions. Soft skills such as personality development, time management pgms, scientific way of teaching etc. 6. No electicity in the school as its outside village and requested if some thing can be done here. 7. Library rack to keep books. But there is no room available to keep the rack due to the lack of infrastructure. Indiasudar conducts an event to motivate students who performed very well in Indiasudar’s SEBLA project. Students from Panchayath union middle schools located in Karur and Tirupur Dt of Tamilnadu will participate.In the same function, we are also honouring the best teacher, best school, best volunteer and society care takers. All of you are welcome.Please find the attached invitation. Venue: Narathakana sabha, Karur (near Karur bus stand). Dr. Parthiba raja, Professor, Dept of Tamil, Sacred Heart College, Thirupathur. Assistant educational officers (Science) of Karur Dt and Tirupur Dt. 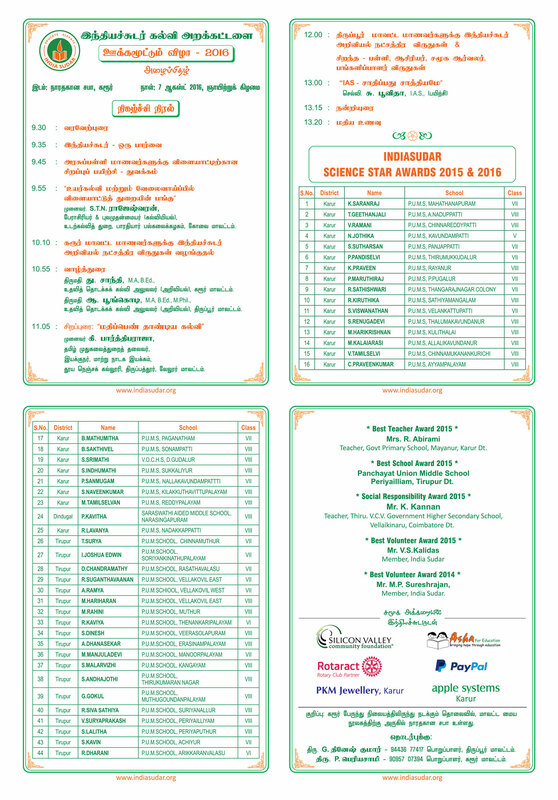 Attached invitation (in Tamil) will give more detail. Indiasudar has trained the teachersdeployed specifically for this project by Indiasudarto demonstrate and explain the fundamentals of Science. They visit schools allocated to them on regular basis and complete the 100 science experiments. Their teaching can lead to better understanding of the subject and increase the science awareness among the students. The experiments are very simple and easily understandable. The experiments are prepared by considering the academic curriculum. The hands on experience will clarify the basic doubts. We wish to mention that this project is being executed in Government and Panchayath Union middle schools of Thirupur and Karur Dt including Govt aided schools. Kangeyam,Tirupur Dt-638701 weekly one full day. School is located 5KM away from Kangeyam Town. Most of the students studying in this school are from economically disadvantaged background. School has sufficient no of teachers. working inoil mill industries. Most of the students studying in this school are from economically disadvantaged background. School has sufficient no of teachers. Scored 1139/1200 in Plus Two @ Bharathi Vidyalaya Hr sec school , Mulanur @FREE OF COST. Rs.40,000 per sem hence 80,000 Rs per year. Rs.3000 per month for mess fee. Father is having 20,000 in hand. Last date to pay fee is 16 July 2016. He already got the details for bank loan and he will apply and avail bank loan after the admission.